Subject: Modified Assured Career Progression Scheme (MACPS) for the Central Government Civilian Employees- Implementation of the 7th CPC recommendation-Clarification regarding revised benchmark of “Very Good” of APAR grading. DoP&T vide OM NO.35034/3/2015-Estt(D) dated 28.09.2016 had clarified that with effect from 25.07.2016, for grant of financial upgradation under the MACPS, the prescribed benchmark would be ‘Very Good’ for all the posts. 2. The Board has been receiving a number of references from various field formations of CBEC, Associations and individuals on the subject mentioned above, seeking clarification whether the revised benchmark of ‘Very Good’ (w.e.f. 25.07.2016) may be applied to ACRs/APARs of 2015-16 and period prior to that, and whether the officers should be given opportunity to represent against the ‘Good’ grading of past ACRs/APARs. 3. The matter has been examined in consultation with DoP&T. DoP&T has opined that there is no question of allowing second opportunity of representation against the APAR which are post 2009 as these are already disclosed to the employees in APAR process. DoP&T vide OM dated 28.09.2016 has implemented the recommendations of 7th CPC, accepted by the Govermnment for enhancing the benchmark for grant of MACP to ‘Very Good'. These instructions are applicable w.e.f. 25.07.2016, the date of issue of Government Resolution by D/o Expenditure. 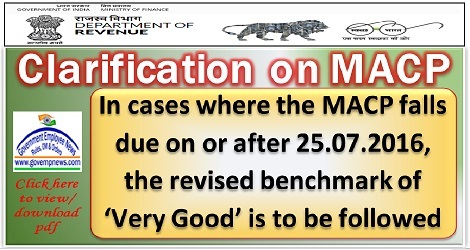 Therefore, in cases where the MACP falls due on or after 25.07.2016, the revised benchmark of ‘Very Good’ is to be followed . In other words, the overall grading of the APARs reckonable for grant of MACP should be atleast ‘Very Good’.